First, let's learn how to harmonize the G major scale. This is the scale on which the four exercises below are based. The major scale interval pattern is 1 - 2 - 3 - 4 - 5 - 6 - 7, giving the following notes G - A - B - C- D - E and F#. G is the root (1), A the second, B the third, C the fourth, D the fifth, E the sixth and F# the seventh. Before working on arpeggios, try to play in order these seven chords ascending and descending. Here are some common guitar positions. 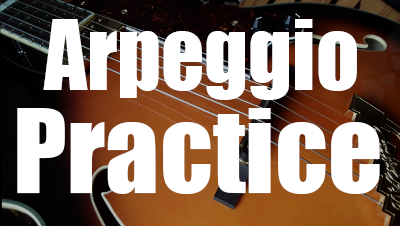 Here are the arpeggios shapes used in this lesson related to the four types of tertian chords found the harmonized G major scale. 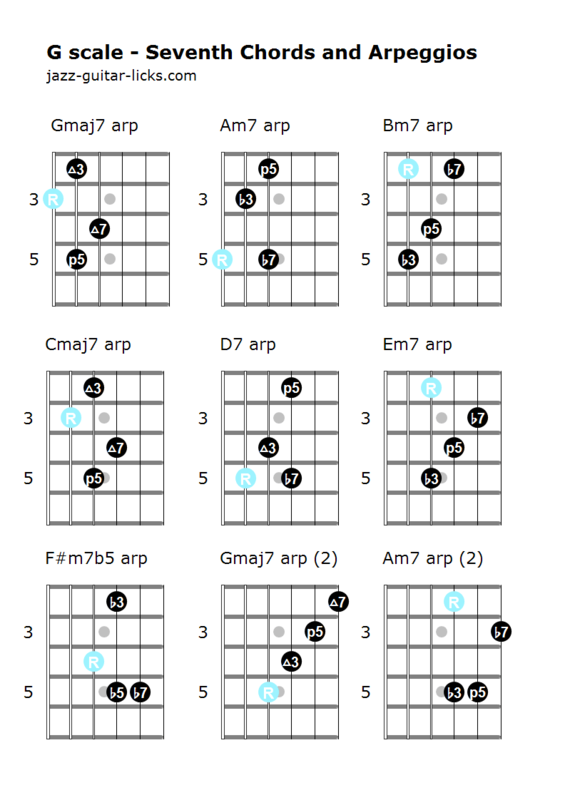 These chord types are major seventh (maj7), minor seventh (m7), dominant seventh (7) and half-diminished (m7b5). The first exercise consist in playing the arpeggios in ascending movements (up-up). Gmaj7 and Am7 have their roots on the E string. Bm7, Cmaj7 and D7 have their roots on the A string. F#m7b5 and Gmaj7 have their roots on the fourth string. It ends with Am7, root on the 3rd string. The second is to play the same tetrads in descending movements (down-down). It starts with Am7 (root on third string) and ends with Gmaj7 (root on sixth string). What are enclosures and how to use them in your jazz guitar improvisations. 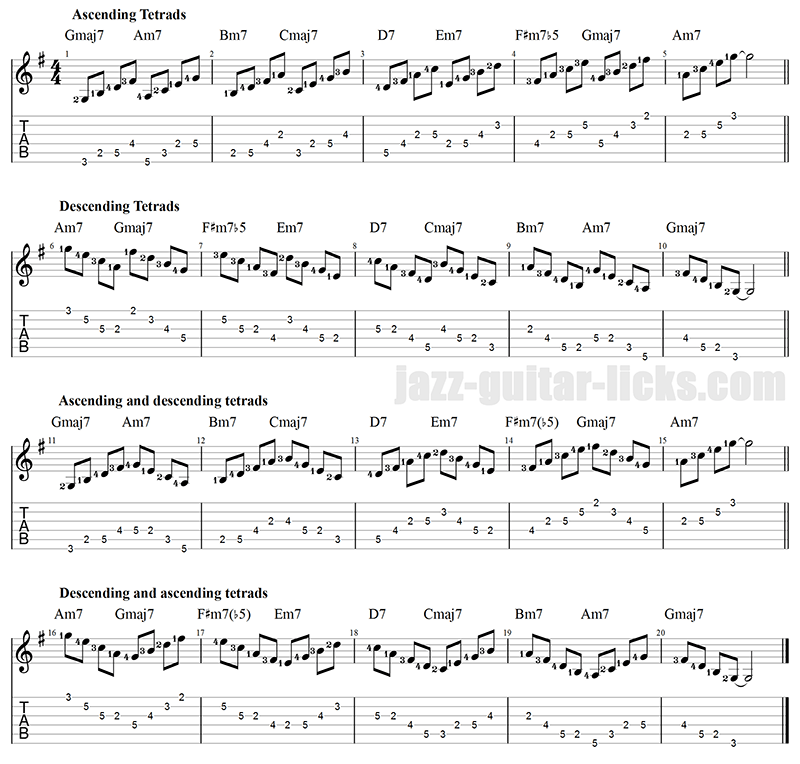 This complete guide for jazz guitar student provides essential tips with 58 free short effective jazz lines in TABS, standard notation, diagrams and analysis for a better understanding of how to approach the most important notes of a chord.